The danish CTF team Pwnies has held its first CTF during the Bornhack maker camp. I wasn't there but I did manage to solve a few puzzles and one of them was quite interesting. It contained four different challenges each worth a flag using the same bug in different ways. The binary can be found at https://ctf.pwnies.dk/. In the end I had a shell and lifted the original binay and libc from which I built a docker image so that I could redo the exercise locally which is why you will see "localhost" in my exploit code below. // So where is this flag? // OMG! Have you seen my .bss section? Of course the bug is in while loop near the bottom. The program reads up to 100 bytes from us and prints them back as a format string. The first flag is read from the environment and copied onto the stack so this should be pretty trivial to leak. I will start by making a map of the first 100 or so elements on the stack. Later I can probably identify where each local variable and the return address is located. I will probably also need to leak a stack address so that I can calculate where the return address is located. The above code will leak the first 99*8 bytes of the stack in eight byte chunks and also number them so that I can see how to easily leak specific parts. The bytes from 005 to 010 are the first flag and from 019 the format string buffer begins. These will come in handy. The third flag is copied to a global buffer and then reset at its original location in the environment. 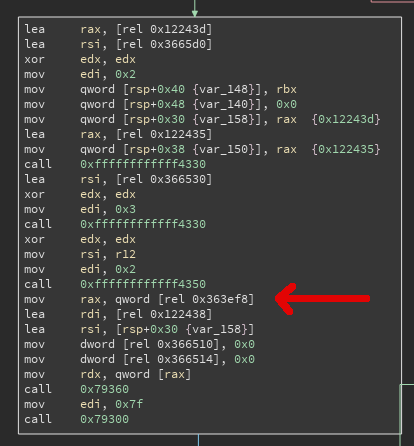 The buffer will be in the bss section and because this is a position independent executable we won't know where that is but probably one of the elements on the stack is a return address that points inside the main executable. From that we can likely calculate a load address and then make a guess as to where the bss is located. I will brute force the elements again looking for the ELF header hoping that some return address points inside the first page of the binary. 000010c0: 4153 4c52 7d00                           ASLR}. 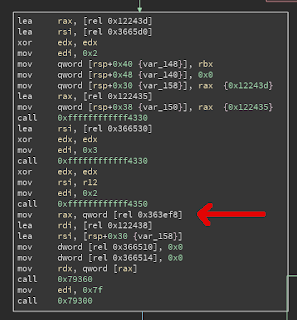 The instruction to the left of the arrow is where we want to land, at address 0x3c4 relative to this function. The only caveat is that we need a null pointer on the stack and the third instruction shows where (the 'lea rsi, [rsp+0x30]' one). At 0x30 higher than the stack pointer, but that shouldn't be hard. When entering this function the return address is at the top of the stack, but then first rbp and then rbx are pushed onto the stack. Then the stack is decremented by 0xe8 or 232. We see in the second block that the first flag is placed at the current top of stack. Looking back into our stack map we see that the buffer starts at the 19th element. Add to that 136/8=17 elements and we find that the return address should be the 36th element. So, if we read the 33rd element we can subtract ((63-36) * 8) from it to get the location of the return address. We now know all that we need. We can learn the location of the return address and we can learn where we want to land and also where to patch a null pointer. Let's do this!